Want to dance, sing, march, get fit and have fun all at the same time? I’m delighted to blend all my passions – dancing, singing and choreography – into a workshop that develops real performance skills. In these intensives we will cover musical theatre dance styles including jazz, tap, Motown, Go-Go, country, contemporary and beginning ballet. 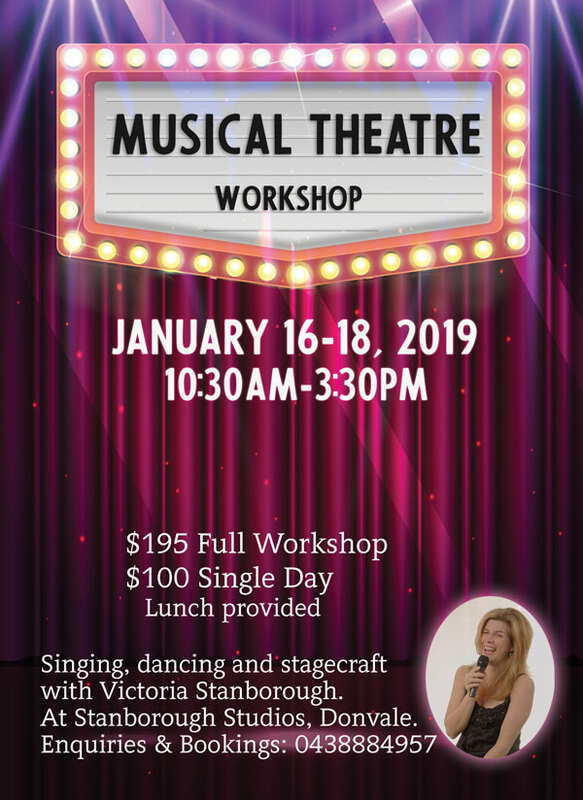 In the first workshop we will be preparing selections from South Pacific, Oklahoma!, Chicago, Carmen and A Chorus Line. Come and join us to be nurtured, challenged and have great fun. Are you already a singer who wants to improve and start performing with confidence and real technique? Perhaps you just love singing and want to learn how to get the most from your voice? Do you need to speak in public and want to get better at it? With over forty years of performing experience and twenty years as a teacher along with a degree in music, I will help you get the most from your voice, whether it is for singing or speaking. My students have become successful in community theatre musicals, gained entry into the VCA, while others have become more confident real estate auctioneers and public speakers. Generally fees are charged on a Term basis, being calculated by the number of weeks in the school term, ie. fees for a 10 week Term will be $400.00. Casual one-off lessons are $80.00. Fees are payable in advance, by cash or EFT, due on or before the first lesson of each Term. In the case of illness, 24 hours notice is required to cancel a lesson. Another lesson time may be offered during that week, if available. Lessons unattended, without 48 hours notification, will be charged. Lessons missed do not carry over into the next Term. As fees are charged on a Term basis, the full Term’s fees are payable if students take holidays or personal leave. A replacement lesson will be arranged at a mutually convenient time within the Term, if the teacher is sick or absent. Lesson fees will not be refunded, as each student’s time is kept for them during the Term. Lessons are usually given on Public holidays.